The very first Post Office in Carson City was a little log cabin on the corner of Ormsby (now Curry) and King Streets, where the Rinckel Mansion stands today. It opened in 1858, around the same time Abe Curry showed up to start plotting out the town. That same cabin was still in use when Nevada became a territory in 1861, and it was still in use when statehood was acheived in 1864. In fact, it wasn’t until 1873, when Mathias Rinckel bought the land and announced his plans to build a grand mansion on the site, that the post office finally moved to Carson Street. 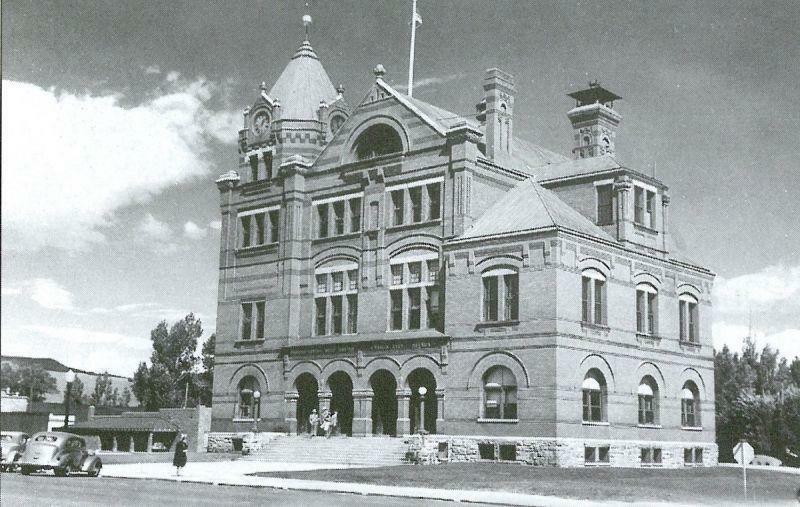 A decade later the post office was already outgrowing its new home, so the federal government decided it was time to construct a proper building for Carson City. Nevada Senators Stewart and Nye were at the forefront of the movement, and they managed to get a $100,000 appropriation passed in the Senate for construction. The new building was designed to have plenty of room, room not just for the post office but for a wide variety of other federal offices as well. A site was chosen in the 400 block of Carson Street, and existing buildings were demolished or moved (most notably the Carson Opera House, which had to move one block back, to Plaza Street. There’s more about this in Then and Now #19). Plans were drawn up by M.E. Bell, Supervising Architect of the U.S. Treasury, and a construction bid was awarded to John O’Connor of Buffalo New York. All this Eastern influence and participation is the reason Carson City ended up with a distinctly non-Western red brick Richardsonian Romanesque ediface at the heart of town. Nevadans didn’t have any say in how the building was going to end up looking, so it didn’t look like anything else in Nevada. The cornerstone was laid on September 29, 1888, and although the plans were for construction to only take one year, it ended up being two and a half before the building was ready for the post office to move in. This it did in May 1891, along with a few other government agencies: the Land Office, the Weather Bureau, and the United States District Court. This picture here is from 1930, when the building was nearly 40 years old. Notice how the flagpole sticks right up out of the middle of the roof. The building’s custodian had to scramble out of a window and across the steep-pitched roof every morning to run up the flag, then make a return trip in the evening to retrieve it! This building ended up being Carson City’s most long-lived post office. It wasn’t until the 1960s that the postal service started to feel cramped here and started looking for a new home. That new home was finally built in 1970 just a couple of blocks away, on Washington Street between Plaza and Stewart. On September 20, 1970, after 79 years in this red brick building, the U.S. Post Office officially moved out, leaving the place vacant (the last federal judge had left and moved to a court in Reno five years earlier). The next year the federal government deeded the building and the land it stood on to the State of Nevada, who had grand plans for it. Immediately work began to renovate the old building and turn it into the new home of the State Library. 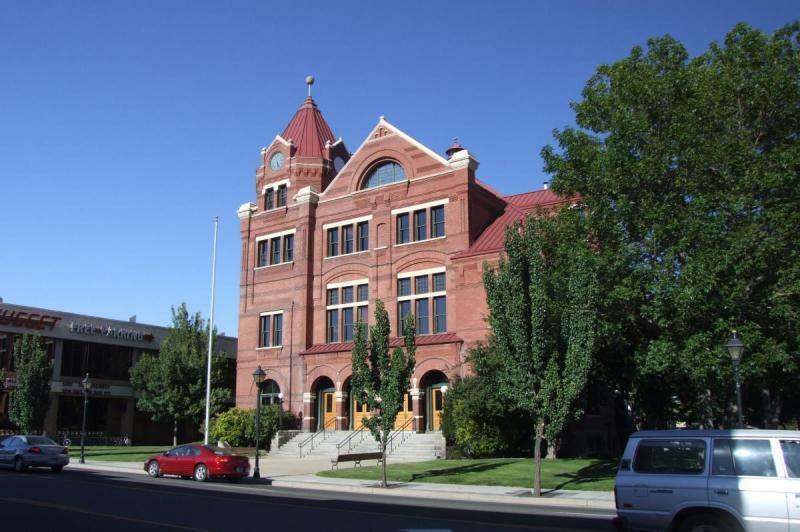 The Library, just like the post office, had been bounced from home to home throughout Carson City’s history. At first, before the Capitol Building was constructed, the State Library was the ward of the Secretary of State, and the small collection of books was kept in his office in the Ormsby County building. When he moved into the new Capitol Building in 1870, so did the Library. Over the years the number of books in the state’s posession grew, and quickly overran the Secretary’s office. So they started storing them in the basement (or the dome, according to some) of the Capitol Building. But even that was full by the turn of the century so they built an annex to the Capitol in 1907 and moved the books there. They moved again in 1935 when the new Supreme Court building was built across the street. And again in 1972, into the old Post Office building. But even this comparatively huge building was no match for the behemoth that is the Nevada State Library. In 1992 it had to move again, because it had once again outgrown its space. This time they built a brand-new building for it just behind the Capitol, specially designed with plenty of room for expansion. After the State Library moved out, the old Post Office building sat vacant for several years before undergoing renovation again. This time the new tenant was the Nevada Commission on Tourism, who remodeled the building to serve as its new headquarters. It reopened in 1998. And with the new occupant came a new name. On May 15, 1999, a ceremony was held on the front steps, and after 108 years of just being called “the post office” it was finally given an official name. It was christened The Paul Laxalt State Building, after former Nevada governor and U.S. Senator Paul Laxalt. Today NCoT still resides in the building. The ground floor is home to their Nevada Magazine publication, and the other floors hold various agency offices. And the clock tower has been restored too, its bells once again chiming across all of downtown. But these bells don’t just chime the Westminster Quarters like other clocks. Every hour on the hour, downtown Carson City is treated to a piece from the Laxalt Building’s repertoire, which in recent years has included Sousa marches, Christmas carols, 40s standards, and Broadway showtunes!